Whether politicians are good or bad is a matter of continuous debate. However, there is no denying the fact that each of us does give a lot of importance to politics and follow it closely. Politics in the United Kingdom has never been shorn of interest and excitements, and there have been twists and turns. In fact, the latest decision of Britain to get out of European Union is by itself a shocking new twist to politics in this country and across the European Union. In this article, we will have a look at the General Election odds in the United Kingdom because it is a big money spinner and millions of pounds are earned and lost in this democratic exercise. There is no doubt that when it comes to elections in the United Kingdom, there are basically two main players. They are Conservatives and The Labour Party. There are other parties like Liberals too but their area of influence is very limited, and they usually do not make any major impact on the electorate. Hence when we talk about election odds we usually talk about the two major parties and the others are often referred to as “also ran” parties. We will look at the odds of the upcoming General Elections keeping only these two parties in mind. After the Brexit missile, had hit Britain, Cameron was forced to quit because he staked everything to ensure that Britain stays within the European Union. He was replaced by Theresa May, and she has time till 7th May 2020 to steer her Conservative Party government. It would, therefore, be pertinent to find out how punters and bookmakers feel about her and her party as far as the next General Elections in Britain is concerned. Of course, despite the recent setbacks, it would be naïve to dismiss the Labour Party which has a mass following and a sizeable number of committed voters. A shift of a few percentage points of votes from Conservative to Labour party is all that is needed. There are millions of undecided and last minute voters who could make all the difference. As far as the UK General Election odds are concerned as mentioned above, there are only two main contenders, viz. Conservatives and the Labour Party. 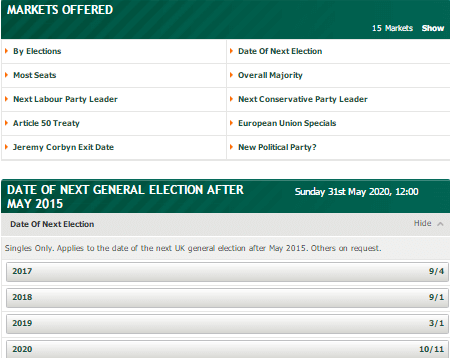 As per the latest odds, the Conservatives are favoured 8/11 to win the next election in Britain. Hence as of today, they are very strongly poised to form the government again in 2020. However, it is still early days, and there are almost 41 months to go before the elections take place. That is too long a period in politics and Theresa May has quite a few things to take care of guide Conservatives to the next victory. On the other hand, Labour Party is in the process of rebuilding the party after the series of electoral debacles which it has suffered over the past many years. The Brexit decision has well and truly been a body blow to the party, and Jeremy Corbyn has a tough job ahead of him. As per the latest odds, things are not exactly looking very juicy for Corbyn and his Labour Party. The odds have a 6/1 figure as far as their chances of winning the next elections are concerned. This is not very healthy when compared to the 8/11 odds which the Conservative Party enjoys. But given the fact that Theresa May is new and has to exercise control over the party and the government is something which gives some bit of hope to the Labour Party. Further, there are many analysts who believe that the negative fallout of Brexit might result in many undecided voters developing an antipathy towards Conservatives. If this happens then things could become brighter for the Labour Party and who knows Corbyn could be the surprise next Prime Minister of Britain. Elections are won and lost by the number of seats. Hence this is an important parameter based on which betting is done by punters and gamblers. 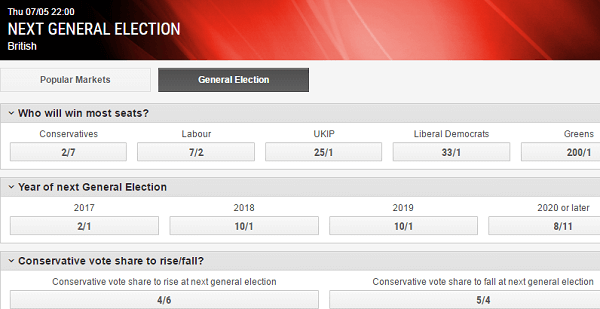 As far as the next UK General Elections are concerned, the Conservative Party as of today has 2/9 odds in their favour as far as winning the most numbers of seats are concerned. This is based on their current strength, and the Brexit results certainly would be shot in their arm. The results have literally floored all opposition and if the momentum continues they may end up securing an overwhelming majority. However, the way the economy performs also will have a major role to play. Brexit or not at the end of the day, people will come back to brass stacks. They will judge and evaluate Theresa May and her government with the kind of jobs they can provide and how they are able to tackle other problems like a security threat, terrorism, inflation and other pressing issues. 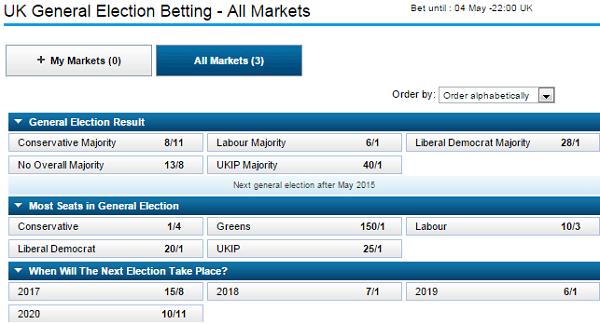 It is here that next General Election odds may slip away from Conservative favour. Is There a Chance for Mid Term or Early Elections? Though elections are slated only on May 8, there could be reasons for it being held a bit early. This will happen only if the Conservatives feel that it is worth taking the gamble. However, as of now, the chances are quite bleak. Hence there are 100/1 odds that elections will be held this year. The odds for the years 2017, 2018, 2019 are 5/4, 8/1, 14/1 and 4/5 respectively. Hence, there are reasons to believe that trying to win money betting on the year of elections may not be the smartest things to do it. So, at the end of the day though there are many factors to be considered as far as next UK General odds and merely voting on the winner and loser may not be the right thing to do. Therefore, as a punter, you must take into account quite a few things and decide on election odds.